As discussed in previous chapter, a table is a structure of vertical columns and horizontal rows with a cell at every intersection. A Word table can contain as many as 63 columns but the number of rows is unlimited. 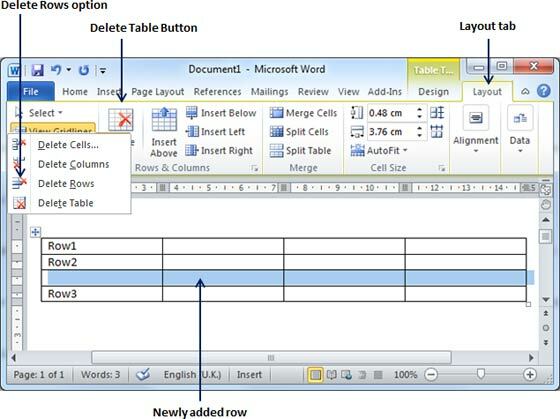 This chapter will teach you how to add and delete rows and columns in a table. 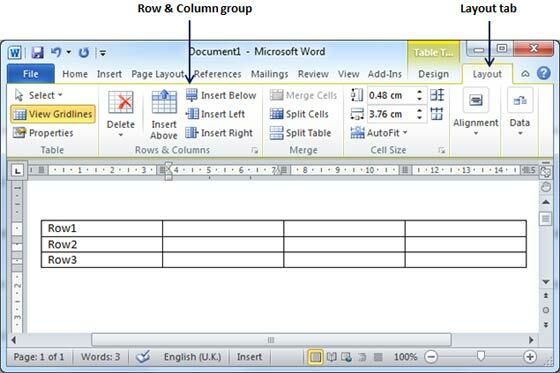 Following are the simple steps to add rows in a table of a word document. Step (1): Click a row where you want to add an additional row and then click Layout tab to have following screen. 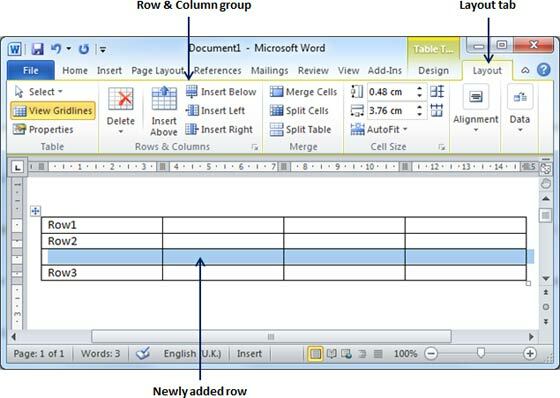 Step (2): Now use Row & Column group of buttons to add any row below or above to the selected row. If you click Insert Below button, it will add a row just below the selected row as follows. If you click Insert Above button, it will add a row just above the selected row. Following are the simple steps to delete rows from a table of a word document. Step (1): Click a row which you want to delete from the table and then click Layout tab to have following screen. 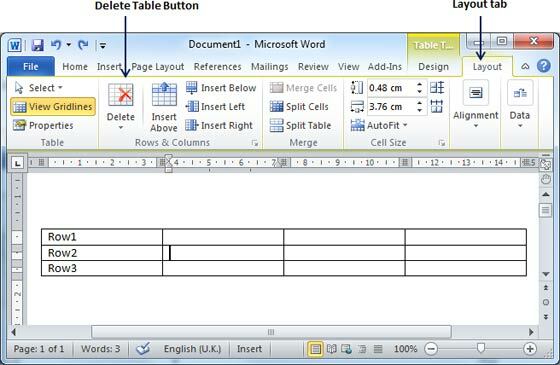 Step (2): Click the Layout tab, and click Delete Rows option under the Delete Table Button to delete the selected row. 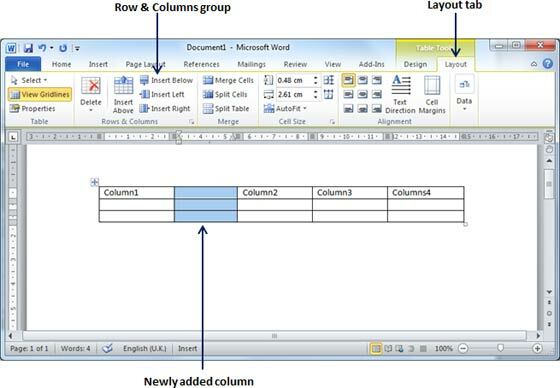 Following are the simple steps to add columns in a table of a word document. 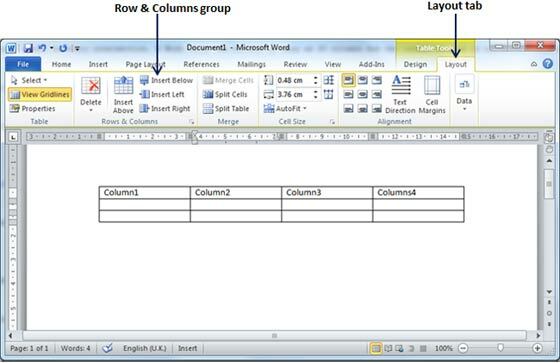 Step (1): Click a column where you want to add an additional column and then click Layout tab to have following screen. 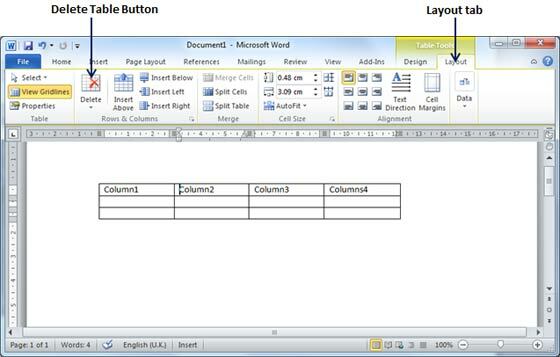 Step (2): Now use Row & Column group of buttons to add any column left or right to the selected column. If you click Insert Left button, it will add a column just left to the selected column as follows. If you click Insert Right button, it will add a column just right to the selected column. Following are the simple steps to delete columns from a table of a word document. Step (1): Click a column which you want to delete from the table and then click Layout tab to have following screen. 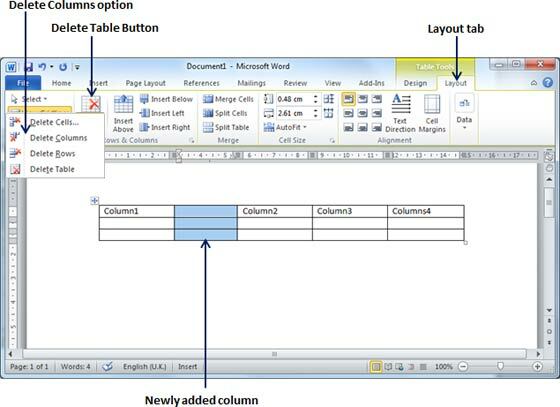 Step (2): Click the Layout tab, and click Delete Column option under the Delete Table Button to delete the selected column.